This article describes the different sets of credentials UniFi uses, along with information on where each would have been set up initially and where they can be changed, if applicable. It is important to note that both passwords and usernames are case sensitive. There are two possible combinations of default credentials for UniFi devices: ubnt / ubnt or root / ubnt. However, if you went through the Setup Wizard you assigned a new password and username in the Controller Access screen, under Device Authentication. The default credentials will be useful when factory resetting a device and managing it in an already installed Controller (hence, forgoing the Setup Wizard). NOTE: The default ubnt/ubnt username and password also applies to the Cloud Key (and SSH access to the Cloud Key) when accessing the Configuration UI of a new or factory-defaulted Cloud Key by typing its IP address in the browser (default is 192.168.1.170), instead of going through the Setup Wizard. Other than that specific moment, the Cloud Key and SSH password is not the same as the Device Authentication credentials. See the SSH and Cloud Key credentials section for details. The Device Authentication credentials are used in the device management user interfaces (UI). For example, when locally accessing the USG by typing 192.168.1.1 in the browser. To see what this password is, and to change it, launch the UniFi Controller and go to Settings > Site and scroll down to the Device Authentication section. This username and password is also used when adopting a "managed by other" device. See this article for more: UniFi - Advanced Adoption of a "Managed By Other" Device. 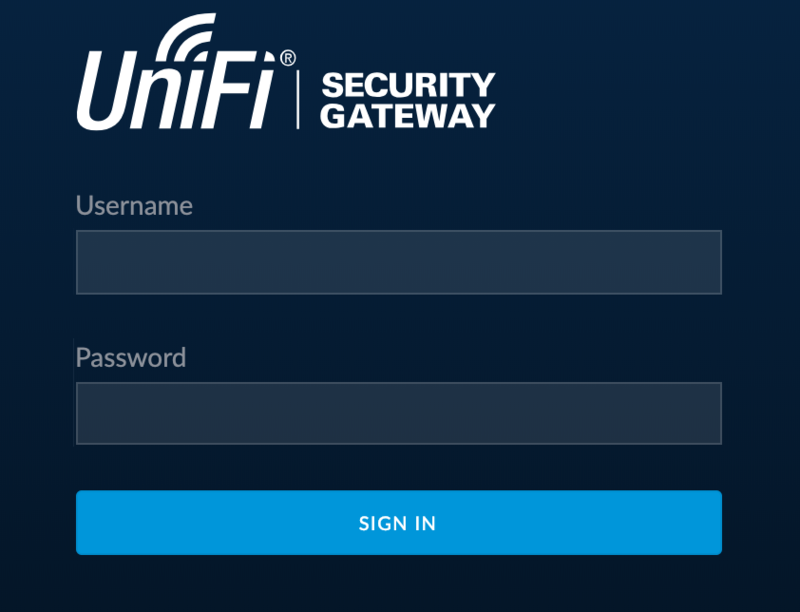 These credentials allow you to log in to the UniFi Controller, either accessing it directly by typing the IP address on your browser, or by going to the UniFi Cloud Access Portal and launching the Controller from there. You created these credentials in the Controller Access screen of the Setup Wizard. You have the option to use your SSO Cloud Account credentials for the Controller as well. See the SSO Cloud Credentials section for more information. If you have access to the Controller, you can change your Controller Admin Name and Password at any moment. 1. Within the Controller, click on your username in the upper, right-hand corner. 3. Here you can change the password, the Admin Name and the Admin email. It is important to note that when you are resetting your password, this is the only email you will be able to send a "reset password" email to, regardless of what email you are using as a SMTP server. 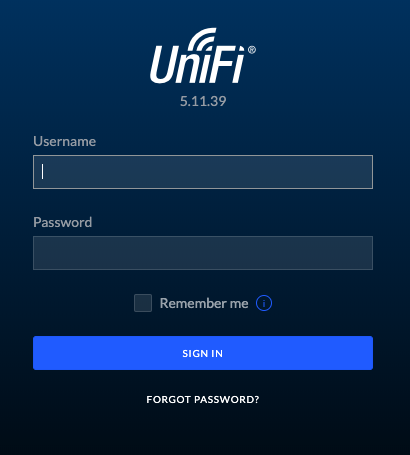 If you forgot the password of the UniFi Controller, you can click on the FORGOT PASSWORD? link under the controller login screen and enter the email you have associated with your Controller (as it appears in the Controller's Edit account section). You will have to click the link in the email to properly reset your password. Until then your current password is still valid. ATTENTION: The password reset email is sent by SMTP server. If you have not enabled it and configured it correctly, this option will not work even when appearing to successfully send the reset email. If the SMTP server has not been set up, there is no method to recover the Controller password: it will have to be reinstalled. See this article on how to set up a SMTP server with Gmail: UniFi - How To Use a Free Email Service as SMTP Server (Gmail). You can also read the SMTP section in the UniFi User Guide, Chapter 3 (page 57). The SSH credentials are the same as the one's used to enter the Cloud Key's configuration interface, accessed when typing the Cloud Key's IP address in the browser navigation bar. The Setup Wizard gives users the choice to use the same Controller administrator name and password for SSH access. However, if a user decides to leave that box unchecked, they will have to provide another set of credentials in the Wizard's Controller Access screen for SSH and Cloud Key access. 1. Go to the Cloud Key's configuration UI by typing the Cloud Key's IP address in your browser. 2. Go to the Maintenance > Security section and change the password and username separately. ATTENTION: There is no Cloud Key / SSH credential recovery, so if that password is lost, reset the device to factory defaults by pressing and holding the Cloud Key's reset button for more than 5 seconds. Once you launch the Setup Wizard for your freshly reset Cloud Key, you can restore from one of your backups. The backup will not restore the forgotten credentials, so you will be able to set new ones without any issues and without losing your other settings, as long as you do know your UniFi Controller username and password. 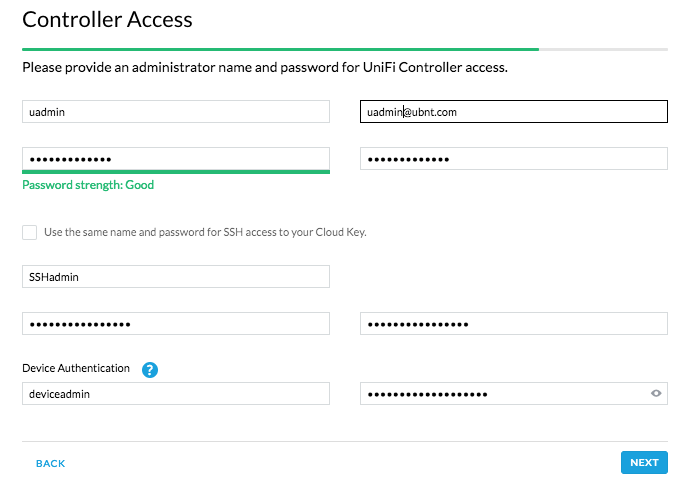 The UBNT Cloud username and password are your Single Sign-On, UBNT.com account credentials created in https://account.ubnt.com/. This set of credentials is used in the UBNT Community, the UBNT Store, and the UniFi Cloud Access Portal. To change this username and password go to https://account.ubnt.com/manage/settings. This is also where you would enable (or disable) your 2FA verification. See this article for more: How to Enable Two Factor Authentication. First name - First name of the user account owner. Last name - Last name of the user account owner. Username - Public display name for the account. Used for sign in on required UBNT websites. Email Address - Email address to receive emails. Can also be used for sign in. Password - This password can be any combination of characters as long as it meets the minimum of 8 characters in length. After the account has been registered, check the email inbox for a verification email to make sure that the proper email account was used for the account. 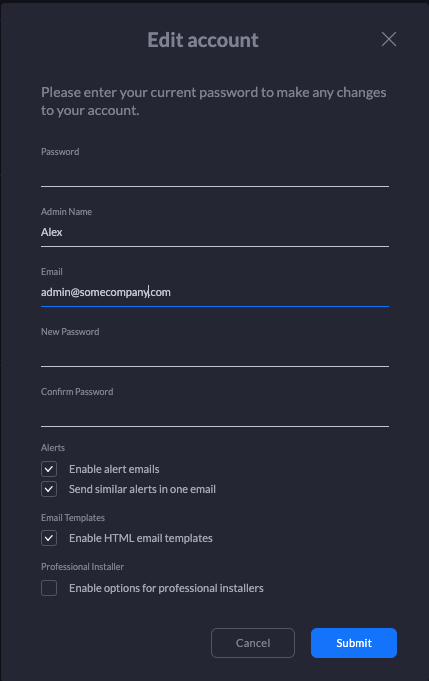 User Tip: If you wish to use your SSO Cloud credentials for your Controller and have one less set of credentials to worry about, you can set this up by logging into your Controller and going to Settings > Cloud Access and enabling the Local Login with UBNT Account. Please make sure to read the tooltip in the Controller before enabling. The UBNT Help Center (https://help.ubnt.com/) uses a different set of credentials than the Community. If you have ever opened a ticket with UBNT support you are already registered but do not have a password. In other words, Support will group tickets according to requester email. If you contact Support they can provide you with the reset password to finish the registering process. NOTE: It is recommended to use Chrome as your browser. 1. Go to the Help Center and click on the Sign In link in the upper, right-hand corner. 2. In the bottom left of the dialog box that appears, click the Sign Up or Get a password link. Fill in the information requested. The Get a password link is also the way to reset a password if it has been forgotten. With your Help Center account you can see your support tickets under My Activities > Requests and you can also give a thumbs-up or down to the articles. Please remember to click the Send Feedback button and let us know what is missing in our articles! This is not a common password to get confused, but it is listed in this article since it is also set up during the Setup Wizard in the Configure WiFi screen. You can change this SSID name and password, referred to as Security Key in the UniFi Controller Settings > Wireless Networks > Edit.